In Angola's capital Luanda, few seemed aware of the unusual event in the skies above, but those with forewarning got a glimpse of the eclipse for around 15 minutes from 1630 GMT. "It's the first time that I've witnessed this phenomenon—I'm completely happy," said stargazer Providencia Luzolo. "It's just I didn't manage to see it that well as it hurt my eyes." According to the Astronomical Society of Southern Africa (ASSA), such eclipses can be safely observed using a basic pinhole projector. 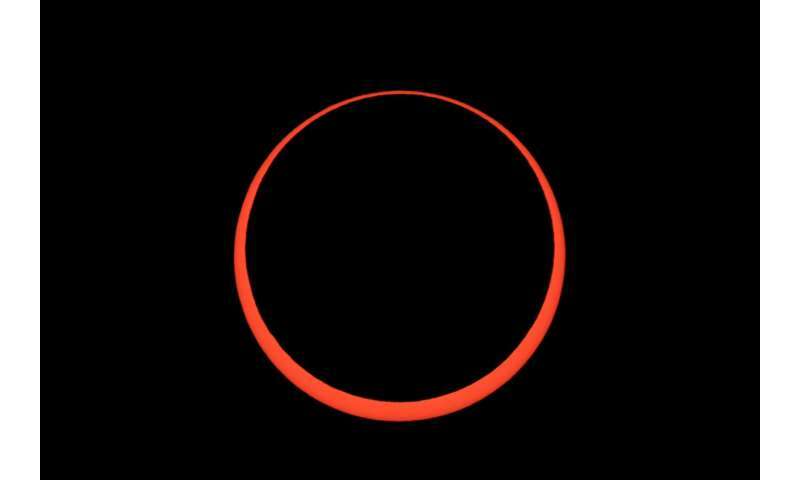 It takes about two hours for the Moon to move across the face of the Sun, but the "ring of fire" peak lasts a mere minute. Was it a golf clap? Or a NASCAR woohoo and a high-five? Possibly even a leaping chest bump variety we witness after a touchdown or an incapacitating blow delivered by foosball players? Are they applauding the Moon? Way to go Moon! Good job! Reeeejection! I guess what they are doing is applauding themselves for dropping a few grand to make the trek to witness the event. Awe inspiring without a doubt, but similar to the applause following a movie in some random theater in New Jersey. Our opportunity comes in August. I did the math, and the moon at its average distance from the earth is almost a perfect match for the sun. If the moon was just 1.2% larger or 1.2% closer it would be perfect. That is an incredibly close match. Why not applaud the moon? It is the science and beauty that make us look to the stars in the first place. Golf clap for the wife, Chest bump with son, NASCAR whoop for the daughter. 3 of my family gathered to watch the annular that went through the Cleveland OH area in the 90's. We used a pinhole mirror to flash images of the crescent sun into school classrooms onto their ceilings during the approach. All the phenomena reported for total eclipses happened, other than the grand spectacle itself. Birds began singing evening songs, the sky darkened, colors became darker and richer. But it's a unique sort of twilight because it's only dark overhead, gradually lightening toward the horizon in every direction.Looking forward to 2017 and especially 2024 which goes right over our heads. We tried to reserve space in a campground on the path of totality of the August eclipse. 4 hours after the reservations opened they were all gone.